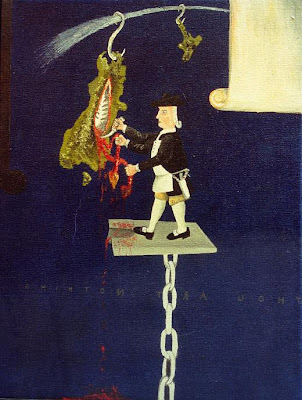 I've just received an invitation to 'The Captain' at Tauranga Art Gallery, so I'm guessing my artwork Thou Art Nothing, 1999 (below) is in the exhibition. I'm heading up to Auckland for 10 days late October, so I'll get to se the show. The invitation features two images: one, Marian Maguire's 'A Portrait of Captain James Cook with a Classical Urn from the Collection of the Admirality' (2005) and Gavin Hurley's 'My Sad Captain' 2006. I love it how the Tauranga Art Gallery managed to snap up the New Zealand 'Art Gallery' URL before any other gallery. 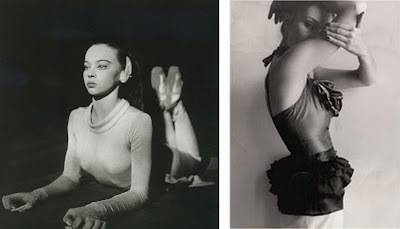 I've found some real gems while looking through a lot of 50's fashion photography, including this fantastic photograph of the french dancer and actress Leslie Caron in sphinx-like pose, claws included. The photo was taken by often overlooked fashion photographer, Clifford Coffin. The image on the right is another Coffin image from a poster that I picked up from the National Portrait Gallery in Edinburgh in 2003. An intriguing image that I had on my wall in Wellington for 2 years. I'd love to know where the poster is now, after six house shifts since I took it off my wall.